SÃO PAULO, BRAZIL – One of the most important risk classification companies in the world, Moody’s Investors Service has placed Petrobras S.A.’s global foreign currency and local currency debt ratings on review for a possible downgrade. This would be the second time Petrobras’ debt ratings was downgraded by Moody’s after in October the oil giant’s debt ratings was downgraded from Baa1 to Baa2 stating that the company’s outlook remained negative. 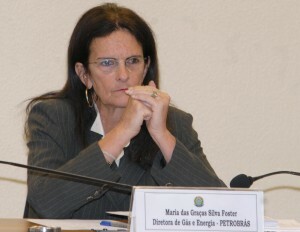 Maria das Graças Foster Petrobras CEO, announced twice the delay of financial results due to corruption scandal, photo by Roosewelt Pinheiro/ABr. Ratings by risk classification companies indicate if a bond from a specific company or government has a high or low risk of default. Ratings which range from AAA to BBB are considered investment grade, with the bonds having a low risk of default. With investment grade companies find it easier to obtain credit and find investors. Petrobras is currently in the middle of the greatest corruption scandal in the company’s history and has delayed twice the release of its third quarter results, originally scheduled for November. This delay is a cause of concern for investors. According to Moody’s in addition to the delays in filing financial statements Petrobras may also be downgraded in near future if its financial leverage increases or if production growth does not meet the company’s targets.